Summer is the perfect time to enjoy the wonderful opportunity to experiment with all kinds of fresh produce. One of my favorites summer time treat? Grilling Corn on the Cob. I typically just have the kids husk the corn and then cook the corn by throwing them in boiling water, but this summer, I wanted to try out our new Weber Charcoal Grill, and the corn did not disappoint. When we went to a street festival last weekend, grilled corn on the cob tempted me the whole evening. Oh, it looked so delicious, but knowing that my local grocer was selling ten cobs for only $1, I couldn’t justify $4/cob, even if it was dripping with butter. For a few extra minutes to husk the corn, and grill it, I saved nearly $27 for my family of seven. Pull back the husk, clean the corn and remove the inside silk, then pull back the husk. Submerge the the corn in water for at least fifteen – thirty minutes. 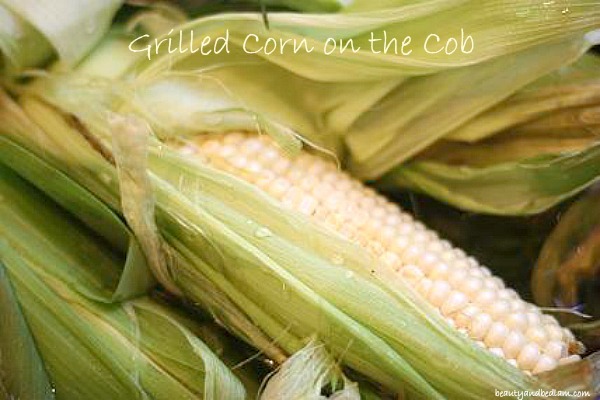 Remove the corn from the water and then shake off any extra moisture before putting on grill. Here you have a choice to brush the corn with olive oil or garlic butter before grilling butter, OR wait and have each person season to their own taste. I choose to do this because I wanted to cut out the butter and just enjoy the naturally sweet taste of the corn. Corn will be done in about twenty minutes. When the kernels are soft, you are ready to eat.